But you knew that already, didn't you? It's logical that as any public discussion expands, either through the number of participants or contributions, there's a greater chance it will touch upon new, divergent topics. This idea is neatly wrapped up in Godwin's law, a concept created by Mike Godwin, which states that as any online debate grows longer, "the probability of a comparison involving Nazis or Hitler approaches one." On Reddit, that's especially true -- in threads with more than 1,000 comments, the likelihood that "Nazis" or "Hitler" will be referenced at least once is more than 70 percent. The statistic has been put forward by Curious Gnu, an anonymous blogger with a "passion for numbers." 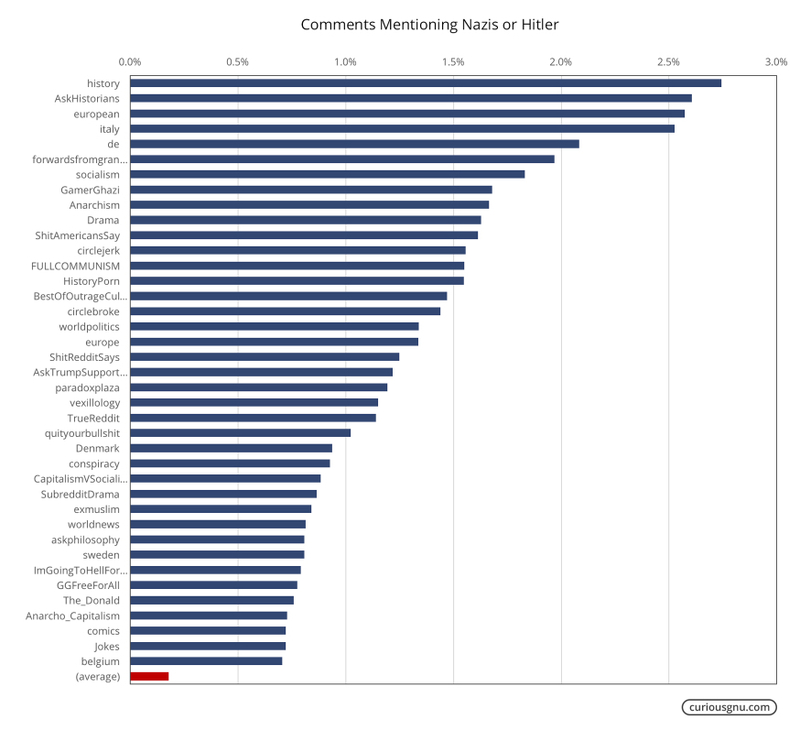 Gnu pulled some Reddit data from the company's public repository on Google BigQuery, before analysing 4.6 million comments to see which subreddits had the highest share of responses mentioning the two terms. Unsurprisingly, the top results were r/history and r/AskHistorians. r/european and r/italy also ranked high. To make the analysis more interesting, Gnu then disregarded all history-related subreddits and examined the probability that any other thread would mention Nazis or Hitler. 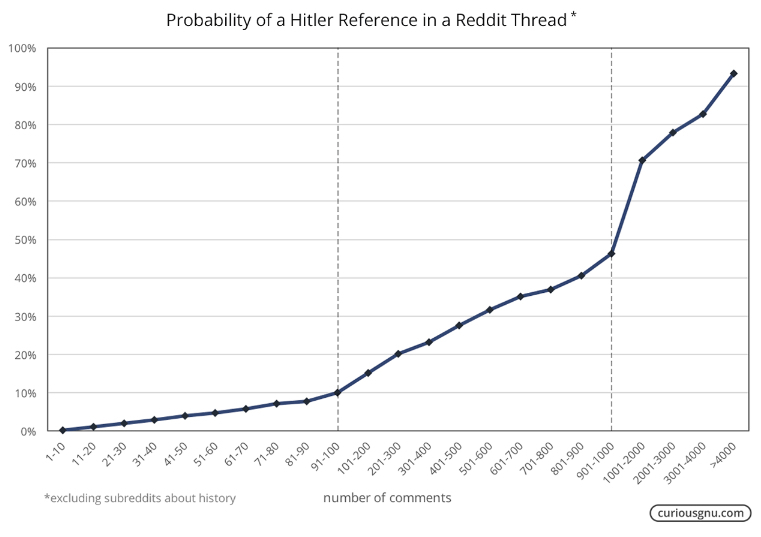 Below, you can see a graph outlining the probability that a thread will reference Hitler in at least one comment. At 100 comments the probability sits at 10 percent, before steadily rising to 45 percent for threads with 901 to 1,000 comments. It then spikes to just over 70 percent for threads with 1,0001 to 2,000 comments, before climbing again to just under 80 percent for threads with up to 3,000 responses. Gnu admits, however, that these figures alone neither prove or disprove Godwin's law. That's because the original theory requires a "comparison" to the original term, which isn't guaranteed with a mere mention of the word. Take, for instance, the phrase "grammar Nazi." Still, these figures lay bare the use of language in current internet culture, especially in the raw, passionate echo chamber that is Reddit.